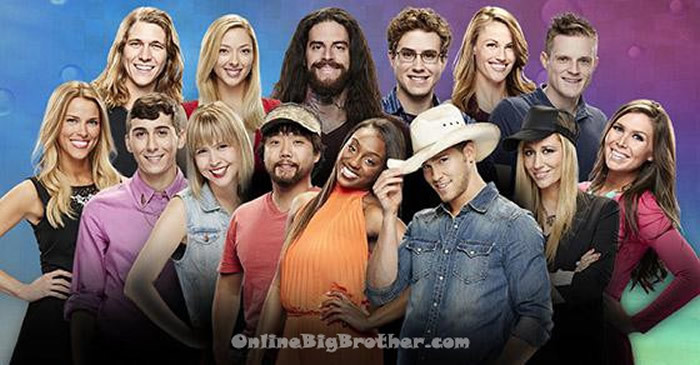 Big Brother 17 aired from June 24th to September 23th 2013, where 17 house guests competed to win the grand prize of half a million dollars. As part of this seasons twist the executive producers decided to bring back the “Twin Twist” this season with Liz and Julia Nolan switching places throughout the first 5 weeks of the season. The twin twist was first introduced back on Big Brother 5 where Adria and Natalie Montgomery were apart of Project DNA. Liz and Julia play as Liz. They switch periodically throughout the week. They only have about 10 to 15 minutes in the diary room to catch each other up on what’s been happening inside the house. They also have to switch clothes. If Liz makes it until Week 5 without being evicted, then both Julia will enter the game to play as herself. The other houseguests discovering the twin twist does not disqualify Julia from entering. HOH Part 1 Vanessa, Liz & Steve competed: Vanessa won. HOH Part 2 Steve & Liz competed: Steve won. HOH Part 3 Steve & Vanessa competed: Steve won. Steve Mosses then won Big Brother 17 by a vote of 6 – 3, winning the grand prize of $500,000. Liz Nolan won the runner up prize of $50,000. James Huling was chosen by America as America’s Favourite Player, and was awarded the $25,000 prize.